When I post my daughters’ “real food” school lunch pictures on Facebook it often provokes a lot of questions. So here – all in one place – are some answers for ya! Now let’s just hope we can get all those with the questions to actually read this post :) If I left out any of the more common ones please let me know in the comments below…I know some of you are just as familiar with these daily school lunch questions as I am! Where do you get those snazzy divided lunch containers? And what does the lunch look like after being tossed all around on the way to school? Don’t the yogurt and applesauce leak into the other compartments? We actually own quite a few different lunch containers, but I do find myself reaching for our BPA-free Ziplock divided containers most often. And there are two main reasons why – First, each compartment is truly leak-proof therefore liquids will stay put no matter how much the box is tossed around on the way to school, and secondly, they are lightweight and easy to wash and open (okay, I guess that is technically 3 more reasons – but we really like these). Plus at the uber reasonable cost of $5+ for 2 containers they are a great deal! How do you keep your cut apples from turning brown (i.e. oxidizing)? – Citrus: As I mentioned, I wouldn’t recommend straight up lemon juice so either water it down or go for something less offensive like orange juice or pineapple juice. – Salt Water Bath: I have not personally tried this, but blog readers often tell me this works great. – Cinnamon: This is another suggestion from my wonderful blog readers, but it will certainly change the apple slices from just being plain (I do think it would add a nice flavor though). – Rubber-band: Surely we’ve all seen the image on Pinterest by now? Slice the whole apple then hold it back together with a rubberband until lunchtime. This would only work if you normally send the whole apple – and they would of course have to dispose of the core or just leave it in their lunch box. How do you keep cold items cold and hot items hot until lunchtime (my child doesn’t have access to a refrigerator or a microwave)? 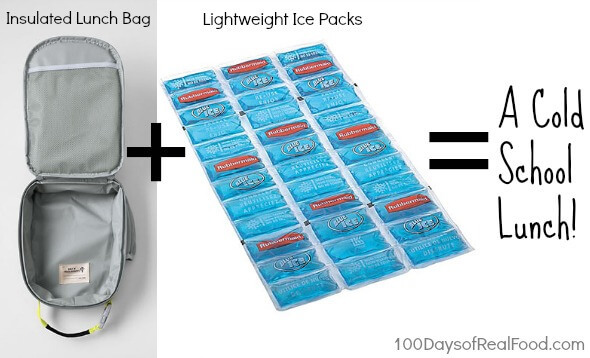 I keep cold items cold by packing 3 or 4 small ice packs together with the lunch box in an insulated lunch bag (we use the “Soft Sided” lunch bags by Lands End because they fit both our lunch box and thermos cup nicely). I keep hot items hot (like soup, pasta, beans, etc.) by heating them up the morning before school and transferring them to a thermos container, which is designed to keep food hot for up to 5 hours (more on those details here). I don’t stress about packing hot and cold together, but I do try to keep them each on their own sides of the lunch bag when I do. We believe that part of eating a real food diet means not counting fat grams, calories, carbs, or even protein. Instead, you simply eat a variety of whole foods (without overeating) and the rest just falls into place. Other countries outside of the U.S. routinely follow this practice and don’t obsessively add up numbers like we do – plus all that calculating can sure take the enjoyment out of your meal in my opinion! But, if you still insist on counting up numbers anyway, please know it is rare for the average person who is eating a varied diet to have a protein deficiency. Please check out my “Why are Americans so concerned about protein?” post for more details. Are you really allowed to send peanuts and peanut butter in you daughter’s lunches? It’s not allowed at my child’s school – what can I pack instead? Our entire school used to be nut-free, but last year they changed it to just one “nut-free class” per grade level. And this is actually the first school year I have not had a child in a nut-free class so it is the first time since my kids started elementary school that I can freely send peanuts, peanut butter, tree nuts, etc. – so, yes, I do just that. And just for the record, when we were in the nut-free class I took it very seriously and miraculously never “goofed” or forgot – but outside of those designated classrooms the school has given us no reason to believe there is an issue with us sending products containing peanuts or tree nuts. Are the lunches you pack enough food for your kids? They look like they would be a small snack for my football-playing teenage son! While I thank you for your concern I do pride myself in knowing my own children well enough to have a good understanding of their appetites. I am certainly not always spot on, but I do think I am pretty close most days. Not to mention we do think real food is much more filling than the processed stuff AND my daughters do both get a morning snack at school (usually oatmeal) as well as an afternoon snack when they get home – in addition to a standard breakfast and dinner of course. Long story short, I can assure you that everyone is well fed at our house. Now my daughters are only 6 and 8-years-old so I would never expect the amount of lunch that is right for them to also be right for a 6-ft tall teenage boy (or even an extra hungry younger child) so please feel free to simply use our lunch ideas for guidance and supplement or switch things up for your own kids as necessary. I personally think leftover dinners would be a great way to fill up hungrier kids. When you pack items that you’ve previously made and frozen (like soup, muffins, waffles, homemade uncrustables, etc.) how and when do you defrost them? Since I am in the habit of packing my kids lunches the day before, I almost always pull out frozen items the night before as well. I usually allow items to defrost in the fridge overnight – which is required for soups and such – but bread-like items that are not already packed with perishable items are fine defrosting on the counter by themselves. Sometimes I forget or just decide to add a frozen muffin at the last minute on the morning of school and, even so, it is still defrosted and totally edible by lunchtime. For more on this topic check out my list of 10 Recipes to Make and Freeze for School Lunches. There is no way I could get my picky kid to eat the items you pack in your lunches – any advice? Right off the bat – the fact that you are here reading a real food school lunch post is a great start! I say get your kids involved in deciding what to pack. But, please remember, it is our job as parents to give them the right choices. For example, don’t ask if they want organic cheese cubes or cheetos – ask if they want cheese cubes or sliced apples! Lots of blog readers tell me that they sit down with their kids and look at my school lunch pictures together so their child can easily point out what real food items they’d like to have in their lunch (love this idea!). For even more tips be sure to check out my blog post all about winning over your picky eater. And most importantly…be sure to use gentle persistence and don’t give up on them! I hope this post helps to clear some things up…please feel free to leave additional questions in the comments below. The last tip is great. My oldest daughter is so picky, so I include her lunch food shopping and packing. I am new to your Blog and I am loving it..You have given me so many great ideas for my 2 year old’s lunch. I wanted to let you know that I recently bought the fantastic Ziploc container on amazon, 4 for $7.96. I love a good deal! Thanks for sharing Kelly! We used to share the amazon link you are talking about, but some people were caught off-guard that it is actually a 4-pack (instead of a 2-pack), and I think at one point they were even sold out briefly. I am glad you were able to find a good deal though. I personally like having 4 of the boxes because sometimes I’ll start packing the next day’s lunch before they are even home from school yet with their containers (that’s on a really good day of course). Thanks for reading the blog! I’m looking on Amazon but can’t find these. Would love the link if someone has it handy! I’m Kim from the Netherlands and I must say I love reading your blog. You are a great inspiration to me on eating real food. Next week ( 2nd of September) we start school again and I am dying to try out some of your lunches.. I hope my son will love them. Watch Amazon for the ziploc containers! I ordered them a week ago and got 4 for $6 with prime. They’ve now gone up to $12 (no longer on prime) but things change all of the time! My advice is to make sure you have enough to pack a weeks worth of lunches if possible! I just am responsible for my own lunch, but as a med school student, I only get time on the weekends to do it! My lunches look a lot like Lisa’s kids, but with more food, because it’s usually breakfast, lunch and dinner!! This post is in response to the apples turning brown. A good solution for this is to soak them in pineapple juice and strain before eating. I find this to be one of the best solutions and the apple still taste crisp and delicious. That is great about the apples, I might start experimenting! My daughter will only eat green apples which are obviously a little tart. I keep a jug of lemonade (and hide it in the back of the fridge) and use that to splash on her apples, it sweetens them up a little and they stay perfectly white until lunch.. I soak the apple slices in 1T of lemon juice combined with 1C of water. My son hasn’t complained. I doubled the mix and am keeping it in a glass bowl in the fridge to use several times. 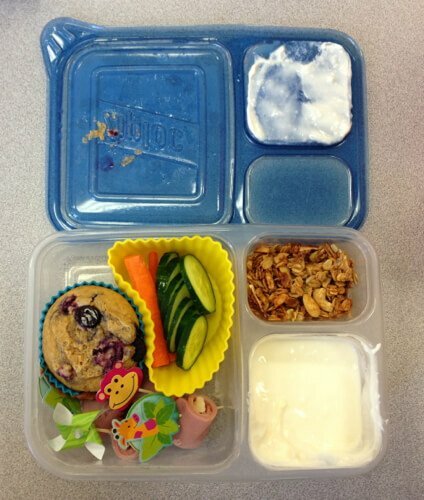 I have to say that I love all of the tips you give about lunches and the lunch boxes! I don’t have children, but use all of your tips and such for packing my lunches and dinners to go to work! I work long hours and don’t want to just grab things at fast food or restaurants. I began using some of your tips and one of my favorites is the peanut butter and apple “sandwiches” which I make and stash at work for snacks! Allison commented about using lemonade for the apples and this is something I have done for a long time! I mix raspberries and lemons with spring water and a small amount of agave nectar to make lemonade. I put a dash of it on my sliced apples and it not only tastes great it keeps the apples fresh! I’ve noticed the same about apple varieties. Red delicious I think are the worst for browning. I copy your lunches and ideas all the time. I have found that one if the things that helps my kids “buy-in” to eating real foods is letting them pick from our “lunch planner”. It is just a printed list of choices in 3 columns and they have to pick at least 1 or 2 things from the first column (fruits/veggies) and 2nd column (whole grains, proteins, etc.) And the 3rd column is optional (has some of the saltier/sweeter options, but still not bad). I laminated one for each day of the week, connected them on a ring and they use a dry erase marker to circle their choices. This also helps me make my grocery list because I have them do it a week in advance. That is seriously awesome and I am totally stealing it! Just wanted to express my deep gratitude for all of the lunchbox ideas. My son just started kindergarten and I never would have attempted “cold lunch” without the wealth of advice and ideas from your site. Just as you said, I showed him your pictures, he pointed out things that looked good (including some very healthy surprises) and so far it’s going great! For those who need to feed older children or adults: I copy the lunch ideas for my own (adult size) lunch. I just increase the portion sizes or sometimes swap things around based on what I have available in the fridge that week. These lunch ideas are more inspiration and ideas for me rather than exact recipes and since copying these ideas (rather than buying my lunch like I did before I started eating real foods) I look forward to eating lunch each day. Thanks Lisa for sharing your children’s lunches with us! Our first week of lunch packing for our first kindergartener is coming to a successful close. I bought and used all the things you specified. So, for the direction: many thanks! I have come up with some questions for clarification though. How do you get the smoothie pop to bend into the Zip Lock container? I was trying to be gentle, but I tore our smoothie pop mold on day one! Also, what size silicone cupcake molds do you use? Large, small? I have the standard Wilton silicone cups and they seem a bit small to hold anything. I also don’t understand how you fit so much into your child’s lunch bag. This morning I sent a ziplock compartment container and a thermos, the 10oz Foogo. It was very difficult to fit them both in. I ended up putting the thermos on top of the ziplock and luckily it zipped up. Is my model of soft sided lunchbag different than yours? I would like to understand what you mean when you say 3-4 ice packs in the bag. I can understand one sheet underneath and one sheet in the mesh pocket in the main compartment of the soft sided lunchbag, but I can’t see how you get 3 or 4. Would you also recommend utensils that are appropriate, yet not too expensive in case they get lost? I have two things to offer: I put cubed avocado with a touch of sea salt in the silicone muffin cup and my son loved it. Also, in the morning, the cold and frozen parts are assembled at about 6am. They leave for school around 7am. My son prefers the pops to be pops, not smoothies, so I put it all together and put the ziplock container in the freezer. Everything had a great chill and the pop has stayed frozen enough to be a popsicle at lunch (11:20ish) and it was very simple to grab and put in the bag at the last minute. 1) I usually “break up” the smoothie pop a little bit by moving it up and down across the edge of the counter. Then it easily bends into shape. 2) While we own standard and jumbo, we usually use the jumbo sized muffin liners since they go all the way to the top of the ziploc container and keep things separated. 3) When we send soup or something else in the wide thermos food jar, we don’t use the ziploc container. Take a look at the lunches in this school lunch roundup and you’ll see what I mean. https://www.100daysofrealfood.com/2012/09/04/school-lunch-roundup-ii/. We have noticed slight variations with the lunchbags, but they’ve all fit the thermos water bottle. Sometimes we put it in the outside (side) mesh compartment, sometimes in the main compartment, and sometimes in the smaller compartment on the bag’s top. It just depends on which bag and what’s packed that day. 4) You can cut the sheets of ice packs into different shapes. We may use say a 3×3 sheet on the top and bottom and maybe a 1×4 on each side. 5) We have a 2nd set of cheap (but still stainless steel) silverware we send in the girls’ lunches. That way it’s no big deal if they lose a piece here and there. We’re not concerned if they match :) I don’t remember where we got them…probably Target or Walmart. i bought a set of stainless silverware (i think it was 4 forks, 4 spoons, and 4 knives) at Target for under $5. I also bought two BPA free plastic plates at Target. I keep all of this in my cubicle at work and then if I need them they are there. The only tricky part is remembering to wash everything right away so nothing gets crusty. If for some reason I can’t get the silverware clean I take it home for the weekend and run it through my dishwasher. I also have two or three cups that I rotate in and out for water. Usually I bring one in on Monday and then take it home on Friday for a good washing – since it only holds water I just rinse it out during the week. The easiest way to get your smoothie pops to bend is to freeze them that way. I place all 4 molds bent into an empty yogurt tub, fill molds leaving space at the top, cap, then place the tub into the freezer. The molds should be bent enough to place directly in a ziplock container. For cheap stainless steel silverware, try St. Vincent Depaul, Goodwill or other thrift store. The silverware might be mismatched, but that’s half the fun. Plus, you will be reusing instead of creating more waste by buying new. Soaking apple slices in grape juice (DIY Grapples!) works great, as does soaking banana chunks in orange juice. Wonderful post, Lisa! Biscoff is, I believe, nut free. Am I correct? If not, I’ve been doing myself some possible harm. So thankful for your bog. Found it last year & have been packing adult size versions of your lunche ideas for me & my husband. Keep up the important work! I bought the Ziploc divided containers at Raley’s last week. One of the containers ended up broken in both the small compartments on the first day of use. Anyone else have this problem? Amy – I can’t speak for others, but the containers usually last the whole school year for us. If you freeze them they can become brittle so be careful with that. I wonder if yours were slightly damaged before you got them? Also not sure what you’re packing them in, but the soft sided lunchboxes provide protection during transit. Never had that problem. Knock on wood. My kindergartner used the same two all last year and is now reusing them in first grade. Two was perfect, because there was always a clean one ready to go for the next days lunch. We have been using the ziplock containers since the start of this school year and love them. My kids are particular about their cold stuff staying cold, and in this Florida heat even ice packs can’t keep the food as cold as they want it. I freeze yogurt and applesauce overnight in the smaller portion cups of the divided container, I don’t have to add any ice packs at all and the food is perfectly defrosted and super cold by lunch time! 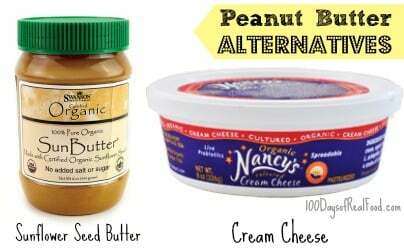 Hummus is another alternative to peanut butter and is very easy to make! My son’s school doesn’t have a cafeteria so we pack every day. It is nice because I can totally control what he eats. He rarely ever complains about what I put in his lunch and eats such a nice variety of foods that I don’t have to stress too much about what I pack. He likes sandwiches he can assemble himself (my healthy version of lunchables). He will also eat leftovers as there is a microwave for the kids to use. I have really enjoyed all the ideas for lunches that everyone has shared and have added some of them to our lunch menu. Thanks!!! I was inspired to get the Ziploc containers (and Land’s End lunchbag) because of your posts! I am packing lunches for the first time this year. My daughter’s only complaints so far: 1) One day, I packed too much food (the Ziploc was almost bursting, and she brought about 1/3 of the food back home), 2) she wants her “snack” to be packed separately. My only complaint is that the very first day of school, the Ziploc’s lid got broken. Good thing we have 3 more! By the way, I got my Ziplocs on drugstore.com. Right now, they’re $4 for a 2-pack. Just snagged the ziplock containers at target. Woohoo! Didn’t even know they existed. Awesome affordable bento boxes. Love them! I love your website! Great Information! My daughter just started pre-k this year and she loves bringing her “real food” lunches to school. Thank you for all of the great ideas and recipes. I love this blog! Thanks so much for all the great ideas. I am actually looking forward to packing lunch this year for my 7 and 5 year old. I showed them the pictures and had them pick what they thought they might like. Thanks Again!! Hi! I was wondering if anyone had found the ziplock divided containers at Target this year? I’ve been to two locations with no luck. Help! Thanks. My local Target doesn’t have them either. I have found them in the past at Wal Mart and my local Fry’s grocery store. You can also find them on Amazon. I searched and searched and finally found a Target in my area (SoCal) that had them. Could be some are just out for some time before able to restock. I found mine in the grocery store in the food-storage aisle. We live in the Carolinas and I believe it was at Food Lion. Here is a great tip to stop apples from turning brown: use a ceramic knife! I bought one for my Dad and he loves it. We use the Eco Lunch stainless steel lunch bento box. Much better than the plastic ziplock container. I’ve considered those as well. But, I’m afraid of juices spilling from one compartment to another. Have you had any problems with this? I put apple slices in a little bit of sprite or tonic water to keep them from turning brown. I love the yearly school lunch reminders. I’m still getting the hang of it, so refreshers on ideas are always helpful. I remind myself it’s a discipline that we are learning, it will take practice! Also, just have to say it’s good to hear of parents taking nut allergies seriously. My daughter is severely allergic to peanuts, walnuts, pistachios, and cashews. SEVERELY. Like 5 minutes and she better have epinephrin. While these allergenic children are so young and still learning their bodies response (like, oh! my throat is scratchy, I need fresh air & water and benadryl quickly), it’s so important to give them safe places. It’s different as an adult because you know those little tingles & sensations that your body has when it’s feeling an allergy and you can act super quick! Children might question it or ignore it until it’s too late. Scary as a parent sending your child into a building you know has a product that is life threatening. I tell parents when they ask what that’s like…pretend like you send your child in with something else like poison or anthrax or something very dangerous. That’s how it feels. And then the flip side is these children don’t want to feel like they are keeping others from enjoying their favorite foods either. Love that schools are educating on it these days and taking it seriously! Lisa, I LOVE your school lunch posts! Thanks so much for taking the time to answer these FAQs & thanks, as well, for linking to all previous relevant posts. I love the idea of your readers looking at the photos of your daughters’ lunches with their kids – I may have to follow their lead! Have you dealt with any peer pressure issues? Like, “I want to eat what my friends eat” or “I get made fun of for bringing my lunch”? Just curious how you handle this. I see you use cupcake liners to put crackers, cookies, etc into your daughters lunches. I also use the ziplock containers like you do. I tried it the other day and my kids said their cookies (annies graham bunnies) spilled out all over and got soggy. How do you keep the food in the cupcake liner without spilling? Mindy, are you using the large/jumbo cupcake liners? The top of the liner should be touching the container lid once you put it on. I found mine I. The dollar bin at Target 2/$1. Maybe my cupcake liners were too small! I don’t think they touched the top. I’ll have to look for new ones. Nope :) You can eat just about the entire darn apple (probably should avoid the seeds. I was shocked when I first learned that, but then I tried it–no big deal, it doesn’t even taste bad. I know a lot of kids probably won’t want to eat the core (it’s a texture thing–I have similar issues with ice cream, believe it or not), but it’s possible to do so. In regards to your child’s class not being nut free, I’m assuming there are kids in the school that still have an allergy to nuts, and so it would be beyond awesome of you to not send nut products anyways. Just because your school has given you no reason to believe that what you are sending is not OK, the peanut butter may still be on your kids hands when they leave their room from lunch and another child could have a very serious, and life threatening reaction from say, using the water fountain or opening a door, after your child. I have 2 kids with nut allergies and I am so far beyond frustrated with the schools lack of EDUCATION to everyone in the school. It is a simple thing to send something other than a food that could kill a child. I was wondering what you though about having entrees in the school lunches. You aways seem to have a sandwich, soup, etc., but is it all right if you find it easier to have many small things in your meal? A great way to keep apples from turning brown…..Trader Joe’s (and other stores) sell Vitamin C crystals (basically just ascorbic acid)in a large container for about $10. I mix about a half a teaspoon into a bowl of water and swish the apple slices around. The container has lasted me over a year now. My family uses “Apple Fresh” and it works great. And it’s all natural, we love it! I am wondering if you have found a way to keep frozen stuff frozen? My very very very picky son will not eat most foods – I am not exaggerating! But I have found he will eat green smoothies and such as a frozen popsicle (can’t get him to eat veggies any other way). So if you have any thoughts on this subject it would be fantastic. We are big fans of Honeycrisp apples as well but I have heard that red delicious apples are……1. shipped far (I live in midwest) 2. stored long 3. heavily waxed (not necessarily food-grade). I was told by a natural food activist like yourself to avoid this variety. I have also noticed that they have very little taste. Please do research apples. I am interested in learning more…. I was wondering if you’ve ever used the Planet Box lunch box? I know it is pricier, but I’ve been told that it will last for years. Just wanted to see your opinion. Regarding browning apples. I have found that if I cut the apple under running cold water or inside a large bowl of cold water, they do not turn brown or take days to change colors. We usually buy granny smith or green apples at our home. Absolutely LOVE your lunch ideas. We are used to packing lunches but have a hard time being creative most days. Love your creativity and healthy choices. I think my family would eat most of your suggestions but not quite all. I’ve never heard of the real food eating choice. What exactly does it intale? We are the every other week healthy family which is why we are all 3 over weight. How did you have the will and knowledge to do this and how did you get your family on board? That’s my family’s prob and why we are not the most healthy eaters. I LOVE healthy but I’m out numbered by carnivore carb lovers. We need colorful variety on our plates. So happy I foun your blog. Please don’t quit posting pics of lunches cuz it’s helping me get ideas of how to properly give my family nutrition foods. I finally have my hubby on board for making some changes, but he still doesn’t truly get why we need an overhaul. He thinks it’s mostly because we don’t want our 11 year old daughter to struggle with weight they way we both have. Because of his reasoning, it makes it more difficult to make more changes. I am so open to making drastic changes. I pray that I can get him to read more of your links as to why its important to our overall health. Any suggestions on how to make him want to read the links? I also love that you have included the fact that real foods make you full faster and it means you will not need as much food. Again, thanks so much for all your amazing help/tips. Love your blog! Amazon has the ziploc containers as well. Another idea for stopping the apples from browning is to soak them in apple juice for a few minutes. I use this for my own sliced apples and it works like a charm! Stopped by this post…AGAIN…in order to do some planning for back-from-holiday-break lunches (although it’s so cold here in Chicago that they just cancelled school tomorrow), and I wanted to add a tip for browning apples. Once you slice them, stick them in organic pineapple juice. The flavor of the apple won’t change at all and they’ll stay nice and white. While I don’t always have pineapple juice on hand…if I’m stocking up on apples, I always make sure to grab a bottle. It’s a trick I learned years and years ago…just passing it along. I have a daughter with peanut/tree nut and seed allergies. She was diagnosed at 18 months old. Retested several times and will never out grow her severe allergies. Plus she just recently became a vegetarian at the age of 17 which makes it equally challenging for me to prepare meals. She cannot eat any of the seed butters available. Except for soy nut butter and even that she doesn’t like the taste “says it tastes like peanut butter”. She also is intolerant to coconut and peas/lentils (breaks out in hives). For the peanut/nut/seed allergies, have you tried making your own soynut butter? My daughter can no longer use the store versions because they have added palm oil to them. So we started making our own. You will have to add some oil to them, unlike making other nut butters, but you can choose an oil she is tolerant to, and the taste is sooo much better. I think your lunches are awesome. My son packs most of the time and he loves to take healthier foods. I think its sad that the kids actually make fun of the foods he takes. It doesn’t bother him at all but that means these foods are not available for them at home and that’s sad. It was a very easy transition going from all the snacks they loved to healthier snacks. I left them look at your pictures and give them options at the store. My 8 yr old boy looks ant food on the shelves and will tell you that’s not healthy anymore. And I think I ruined fast food for all of us which is great. Can’t believe what this country is feeding us. Keep doing what your doing you have helped my household so much. Can not wait for your cookbook. I know you probably don’t do soda, but for keeping apples from turning brown, a lemon-lime soda like sprite works well. Better than lemon juice and it doesn’t seem to affect the taste of the apple. I take a small bowl of sprite and dip the apple slice in quickly and pull them back out. To keep apples from turning brown, I use pineapple juice. I use this in my catering and it works wonderful, plus I like the flavor it adds to the apples. Just a quick note regarding the Ziplock containers shown above. I found them at Target in southern MN in December 2013 for $2.74 for a 2 pack. With the $1/2 ziplock coupon that is usually available, you may be able to get them for only $1.25 each. I bought three packs because Target also had a $1/3 Target coupon so it made them even cheaper. Since my boys are new to using these, if they accidentally get tossed at school, I am not out very much money. Then I was looking at them and thought these would be the perfect size to prepack lunches for when we are traveling and also for picnics. The size should stack nicely in our cooler. You can also use honey to keep fruit from turning colors. Honey is a natural preservative. Hello Lisa!! I am getting ready for packing lunches again and ordering fresh supplies to replace the ones that haven’t made it through the year, I have a couple questions. I just went to order the blue ice pack sheet on amazon and the reviewers said that the plastic is so think the little cubes burst. Several said their kids lunch have been coated with the blue cooling material. Has this ever happened to you? That made me think I should order the smaller hard plastic cubes instead. Also where do you get the cute clog napkins. Amazon didn’t seem to really have any. I am planning a back to school food prep workshop to present in our community and will be using tons of your ideas (with reference of course). I have shared your site and info with so many people!! Love your site! I recently purchased the ziplock divided containers but am now realizing I may need a different lunchbox. I can’t fit both the container and a drink. Do you have any lunchbox recommendations? I buy a bottle of Vitamin C powder on amazon and soak the apples in a bowl of water with a small sprinkling of the vitamin c powder. They don’t brown, nor does it change the flavor. I buy the Now brand. I work for a local school and to keep our apples from browning we dip in pineapple juice. I do this for my own lunch. I only use fresh ingredients the fresh pineapples I use always have extra juice when cut. The apples taste great this way! To keep apples from turning brown all you have to do is put them in a bowl with water and a little bit of lemon juice, swirl them around for a second and then take them out. No lemon flavor will stick to the apples. Love your blog – but did have to laugh when you mentioned left over dinner for teenage boys. Grin – growing up with just a sister – I had no idea how much teenage boys eat. I have three and there are no left overs. Ever!!!! :-) But I do use your ideas and just use larger portions. I am trying to find these ziplock containers… I see them on amazon, but I see them listed at $25 for 2? I like the $5 range better!! Am I looking at the right thing, or am I missing something? I always soak apple slices in lightly salted water for 3-4 minutes. This keeps them from browning and doesn’t alter the taste as much as lemon juice can. Salt water soaking will actually sweeten very tart apples, such as Granny Smiths, making them much more palatable for children. Just a note to those of you who have younger kids off at school. I love the Ziplock containers and that the food truly stays separate. However, I had my new Kindergartener try to open these several times before the first day of school, and she never could get it open and she’s a fairly self-sufficient kid for her age. We use the rubbermaid bento box type system ($13 on amazon) and while it doesn’t keep messy foods separate, she can open them on her own. When are you supposed to make the mac and cheese on week 1 of the six weeks of school lunches as it’s not listed on the’weekend before’ section and then just appears on Tuesday to put in thermos? Make it the night before. It’s pretty straightforward and shouldn’t take you too long. Please email me directly at kiran (at) 100daysofrealfood (dot) com if you have any other questions regarding. Thank you for this site and these posts. I’m almost a first time mama, and these posts help me feel better about taking care of my kids…I know about 5 years in the future, but still. I’m already stressing about it and educating myself. To keep apples from turning brown, rinse them in lemonade! Much tastier than straight up lemon juice. I worked at Shoney’s in my teens and that was the trick to keeping them fresh on the salad bar. We would dispense lemonade straight from the drink machine into the apple container. I think it’s funny when people question a parent’s lunch choice. My daughter eats only a half of a sandwich for lunch, if that. So, there was a time when I would send a quarter sandwich as to not be wasteful. Obviously other things as well. I used to get comments about it as if I’m trying to starve my daughter. She eats like a bird! And sometimes a portion of the quarter sandwich would come home! My kids did the 10 day challenge last week and to get them on board for a much different lunch experience, I showed them a bunch of lunches on this site and asked them to pick what looked good. We’ve kept it up (day 13) and their lunched have been much healthier, their choice! In reference to #5, I use Wow Butter in my son’s lunch (if I can’t find Wow Butter, I use Soy Butter.) It doesn’t taste exactly like peanut butter, but is close enough, especially paired with jelly. My son is a fairly picky eater, so for him to give it thumbs up means it is pretty good. It says it is school safe, peanut/tree nut free, and even comes with stickers to put on the sandwich container so there is no question by the school. When I make fruit salad I drain a can of mandarin oranges saving the juice. Then I place the cut apples into the orange juice. As far as #8 with a picky eater I make new things to try as lunches dinners or snacks on the weekends to see if kids like them. That way I know I avoid the problem that if I send them to school with something new and they didn’t like it they wouldn’t have much to eat that day. You should always try. Your picky eater may surprise you!!! Honey bath works wonders on sliced apples to prevent browning! 1 cup of water to two Tablespoons of honey. Slice some of the apple, drop it in the honey water while you slice the rest. Then switch.
. Keeps the brown away for hours. My 10yo daughter has been taking “salad” in here lunch everyday for the past couple weeks. I use quotes with “salad” because its really just chopped up veggies (no lettuce)…she takes a hard boiled egg along or some sliced lunch (organic) with also. My sister in law asked me what kind of dressing we use since she knows we don’t do processed foods anymore. I said “none”…she couldn’t understand how my kids would eat salad without dressing! I giggled a little and said that veggies (especially chopped up small and tossed together) have wonderful flavors of their own! ;) My daughter hasn’t once asked for “dressing” since we started this. Win one for Real foods! To keep apples from turning brown, the easiest thing to do is put a few drops of apple juice instead of citrus. This way your apples don’t taste lemony or salty. Pineapple juice is the perfect method to prevent apples from browning. I buy organic and place about 1 cup into Tupperware container, I then mix in about 1/4 cup water to cut intensity. The pineapple juice does not change the taste of the apples in any way. I slice the apples and place in juice while preparing the rest of the lunch. 2-3 minutes is all you need. I then pat dry with paper towel for fear of apples turning soggy. Tupperware container goes in fridge, reused for a week, then discarded. I cut my apples into slices and lightly sprinkle with cinnamon. Not sure why, but the apple doesn’t turn brown, not even the parts that don’t have cinnamon. Item 4 is spot on, eat a variety of foods and you don’t have to worry about numbers. BTW, I have no small kids but got hooked on real/minimally processed food from reading your blog and cookbook. Hi. You can always use a ziplock within the pyrex. I find they help with freezer burn. I sprinkle a little cinnamon on sliced apples — it tastes good and bonus, it smells like apple pie. Agree that honey crisps don’t turn brown very quickly. I would say read #8 again and just know that it is a pretty common problem. Your gentle persistence (and insistence) will eventually work. :) Involving him in the choices can help a lot, too. We use orange juice for apple slices. It has always worked, and makes the apples taste good instead of sour. It only takes a couple of tablespoons to toss the slices in.